Welcome to Tirupati Structurals Limited. Manufacturer and Supplier of Pumps, Pipes and Fittings, Water Containers and Storage Tanks. We are an ISO 9001:2000 certified company, established in the year 1988. Intensive R and Dunit and Stringent quality measures help us to achieve a present repute in the market. Timely delivery and High level customization are some of the factors, which gives us a competitive edge over the other market players in the industry. 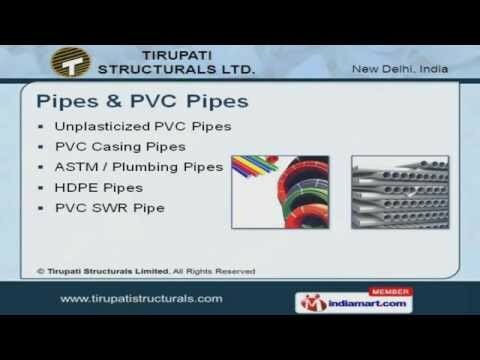 We offer a wide assortment of PVC Fitting, Sprinkler Systems, Pipes and PVC Pipes Our HDPE, PVC SWR and Unplasticized PVC Pipes are best in the industry amongst others. We offer a splendid range of Water and Loft Tanks that are in huge demand across the global markets. We present a rich collection of Pipes, PVC and PPR Fittings that are reckoned all over the world for their superb quality. We are engaged in offering supreme quality Sprinkler Systems. Along with that we offer Hand Pump Solid Waste that is setting a benchmark in the market.